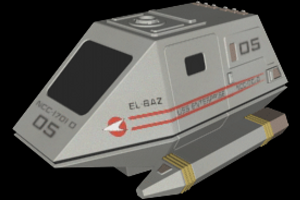 The Type 15 Pod is a two person craft used to carry people and cargo over very short distances, as well as to inspect starships, stations and other Federation facilities from space. It has no warp drive, and very little in the way of weaponry, making it unsuitable for traveling between planets or over any great distance. Traditionally, Type 15's are used for routine flights between ships and stations, or to carry personnel to planetside facilities.